We sold out of the first run of "Silver Edition" Blades in just over 2 weeks. Because of the huge demand, De'vo decided to make this second and final run. This second run has double black ink and special measures to help protect the edges of the deck better than the first run. There is a new copyright (2011) on the 2nd run so you can tell this run apart from the first. This deck has the awesome stock and finish as the first edition Blades that everyone is raving about! We only made about the same amount as the first run, and we will not be printing the "Silver Edition" again. This brand new, amazing deck combines incredible artwork, ingenuity, and ultimate high performance abilities. This unique deck features silver metallic ink, a premium stock, and a new state-of-the-art finish that has to be handled to be believed. The USPCC made this deck with their highest quality standards (Q1) along with De'vo's specifications. The result is a unique, breathtaking deck that looks as good as it handles. This amazing stock and finish combination feels almost like the deck is already broken in and lightly powdered straight out of the box. 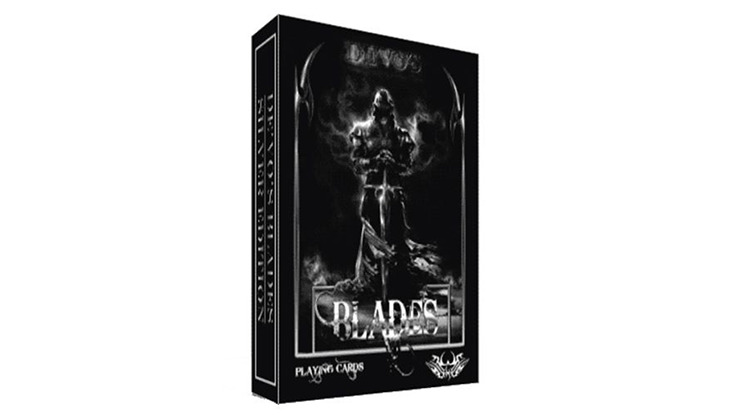 The BLADES Silver 2nd Edition Deck was created by De'vo for his personal collection to be used for XCM and for playing card games. De'vo had this deck made without messy stickers, and instead had it tightly shrink-wrapped. The "tear" tab on the plastic is also clear in color to keep the beauty of the deck preserved while wrapped. De'vo had all of his Blades decks loaded into the boxes with the backs facing out for his Cradle to Grave routine and openers. The back design takes basic design cues from the Tally-Ho fan backs, mixed with De'vo's vision and style. It features 17 individual weapons and is why they are called "Blades." The center star points are designed to look different when the card is turned on its side, and is perfect for the Demon Claw and other displays. The borders are ultra-thin, giving unique fanning and giant fan patterns that vary depending on how many cards are in the fan. The large center stars are great for displays and multi-packet work. This deck has standard white face cards, providing high contrast against the black-bordered backs for visibility during XCM. De'vo also wanted this deck to be able to be used for standard Poker games and therefore kept the face cards virtually original and recognizable. The court cards are in red and black with light highlights on the large inner pips for easy recognition during play. Jokers are always removed for XCM performance and therefore do not conflict with the face patterns during manipulation. During card games, the black Jokers provide a highly visible, "in your face" trump card for various games such as Spades. The sword-in is the small Joker and sword-out the Big Joker. The white blank card and the back of the advert card are placed on the deck as "cover cards." This will make one side of the deck completely black and the other completely white, complementing the black/white designs. This is perfect for spreads and "blank fans" and other un-explored areas of manipulation using different colors of the deck design. The Ace of Spades displays De'vo's famous Demon Claw from his Secret Books. The Demon Claw is perfectly positioned so that it holds the center star of the card below while lying face down. Take two cards and bend them from the sides slightly to see the Demon holding the star. This deck is truly one of a kind for playing cards or XCM. The brand-new finish and premium stock give it a unique feel, and the artwork has amazing visuals. You will be thrilled to own this BLADES Silver 2nd Edition Deck.